Cardigan Jezebel EST.2014. Powered by Blogger. Hello people of the internet! Last month I wasn't even sure if I wanted to continue this challenge. I've done a complete 180 and I'm in love with creating these challenge again! I feel so inspired after seeing everyone's photos during March. And, I'll definitely continue to make them for the foreseeable future! Last but not least, have fun! I cannot wait to see what you guys come up with. I'm really excited for this month's challenge. 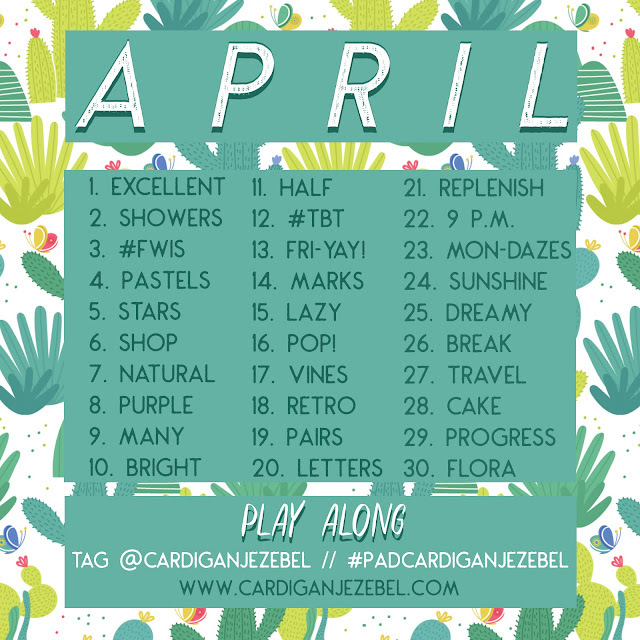 My blog's 4th birthday is in April and I really want to up my Instagram game in celebration! Make sure you're following me on Instagram so you can never miss a post! Are you joining in this month? Let me know in the comments below or on Twitter! A 20-something American living in Ireland. Obsessed with coffee, rewatching The Office until the end of time, trying new beauty products, and hoarding stationery.